We are excited to announce that Amazon Business is now available at Amazon Japan (www.amazon.co.jp/business) and Amazon India (www.amazon.in/business). We are now live in five countries, as these new countries join Amazon Business in the United States, Germany, and the United Kingdom. In each country, Amazon Business helps business customers meet a wide range of procurement needs with business-tailored features. Businesses with entities in Japan and India can now sign up for a free Amazon Business account to start purchasing business products locally. Multi-user accounts: Connect individuals or departments under a single business account, create purchasing groups to match your organizational structure, and gain visibility into how your business is spending on Amazon. Business-only pricing: Get business-only prices and quantity discounts on select items from manufacturers and sellers. Free shipping (limited-time offer in Japan): Free shipping on eligible items, plus access to expedited shipping options. Reporting and analytics: Gain insights into what, when and how organizations are purchasing by creating custom reports on business spends. Amazon Business customer support: Enjoy Amazon customer service through telephone, email, and chat dedicated to registered business customers. Amazon Business is also designed to meet country-specific customer needs. In Japan, businesses can view Consumption-tax (C-tax) exclusive pricing on invoices and receipts while in India, businesses can take advantage of Goods and Services Tax (GST)-compliant invoicing and claim GST credit that can range from 5-28 percent. With the launch of Amazon Business in Japan and India, business sellers also have an opportunity to grow their businesses by reaching new customers in these countries. Sellers on Amazon Business have the ability to offer business-only pricing or quantity discounts to business customers, among other features. Amazon Business launched in the U.S. in April of 2015, and now serves more than one million business customers. Amazon Business launched in Germany in December of 2016 and in the United Kingdom in April of 2017. 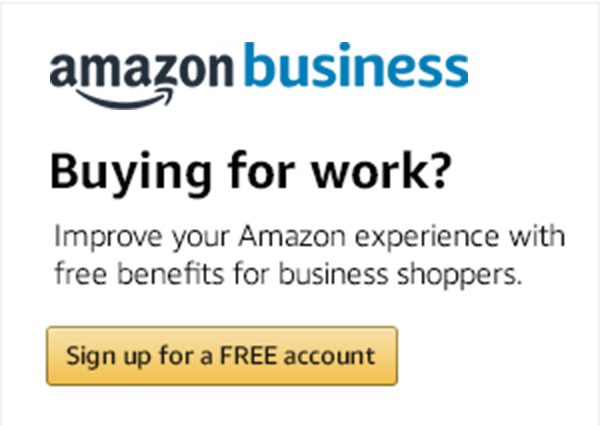 Create a free account today and explore all the benefits of Amazon Business.